These are heady times for those who study mediated communication and social discourse. The January 2015 attack at the Paris office of the French satirical magazine Charlie Hebdo, which resulted in the death of twelve people, ushered in a wave of reflections on the social shaping power of political cartoons in both form and content. Stoked by controversial caricatures of the Prophet Mohammed, the attack demonstrated a deep-seated cultural fissure in the post-9/11 world. Yet, political cartoons rarely make such headlines, typically operating at a lower level of cultural cognizance. They are what scholars call a “domesticated technology,” normalized into our everyday lives. We peruse the latest copy of The New Yorker or The Onion, embedding political cartoons as a means of entertainment, when in fact they are powerful forms that reify social values and set agendas. Consider, for example, the divisive public health issues of Ebola and the MMR (measles-mumps-rubella) Vaccine. Conceptualizations of health and disease are fundamental ways of understanding both the self and society. Disease is at once a biological reality and a social construction. For at least the last 150 years in the western world, visual metaphors of disease—and the proscribed public health policy implications—have shaped the way societies understand and respond to epidemic crises. In the case of Ebola, the disease is culturally linked to blaming Africans, as Cartoonist Patrick Chappatte’s 2014 cartoon on Ebola demonstrates. The MMR Vaccine, likewise, is tied to fears over autism, as in Cartoonist Mike Keefe’s 2015 cartoon on vaccination that probes the controversy between individual liberty and compulsory vaccination. While most see these as contemporary narratives, there are deep-seated historical precedents on both quarantine and compulsory vaccination that date back to at least the 19th century. Misconceptions about both have been largely facilitated through popular culture by means of political cartoons, making them an ideal subject for connecting science and society. Political cartoons first burgeoned in 19th century Western Europe and North America, as the press and the printed word become the medium of the public sphere. As forms of social critique, early political cartoons paid particular attention to the inequalities of 19th century life, epidemic disease and poverty, in particular. The British weekly satirical magazine Punch best exhibits how Victorian communicative technologies shaped and were shaped by larger discursive forces. Punch was co-founded by the social reformer and journalist Henry Mayhew and the engraver Ebenezer Landells. It catered to an expanding middle class readership, and was one of the most popular texts of the 19th century. Punch popularized the multi-modal style of combining text and image—satirical cartoons alongside written commentary—and has been lauded by historians for its journalistic activism. It was also, however, the forum for some of the most racist anti-Irish, African, Indian, and Native American cartoons produced in modern history. In a laissez-faire age when public health supervision by the British government was permissive rather than compulsory, and when individual health was seen as individual responsibility, political cartoons in Punch reified the role of the poor, the filthy, the immoral—those “others” who did not fit the coalescing mold of middle class respectability—in causing and spreading disease. Before the 1880s, the dominant theory in explaining the cause and communication of disease was the miasma theory, a medico-moral belief which held that diseases were spread by rotting effluvia in the air. Individuals predisposed themselves, it was believed, through immoral acts and unhealthy living and working. The cartoonists at Punch, the most famed being John Leech, produced a series of cartoons that centered on disease and public health in the second half of the 19th century. 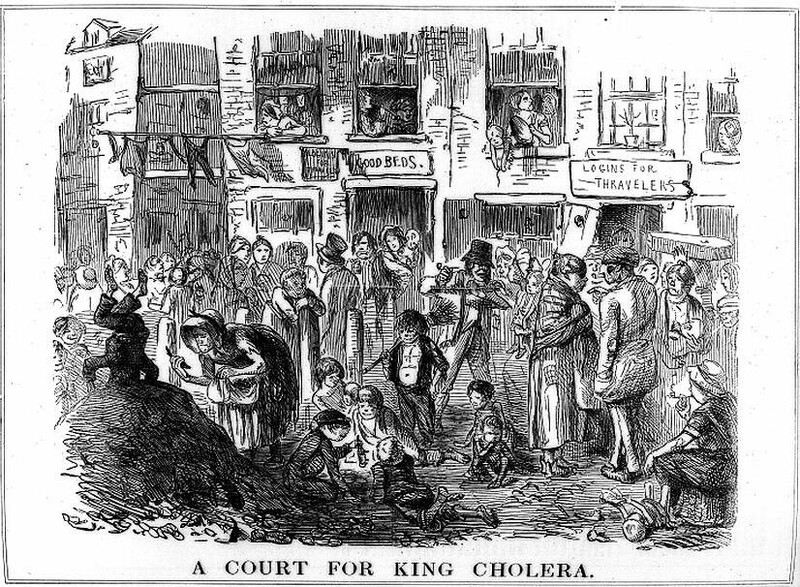 Often, as in Leech’s 1852 “A Court for King Cholera,” the dirty urban poor—literally cholera’s “court”—were blamed for spreading deadly epidemic diseases (Figure 1). Figure 1: “A Court for King Cholera,” Punch (23 September 1852). 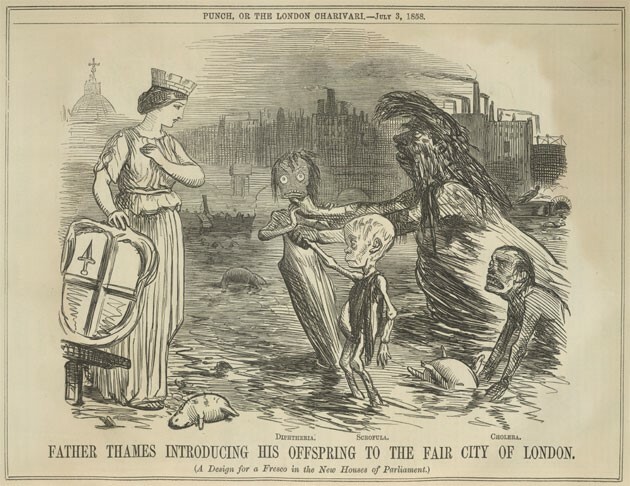 In others, such as his 1858 cartoon published during the Great Stink, titled “Father Thames Introducing His Offspring to the Fair City of London,” Leech personified the diseases diphtheria, scrofula, and cholera emerging from the river sludge by the hand of Father Thames himself, in an effort to elicit humanitarian compassion and policy reform (Figure 2). Figure 2: “Father Thames Introducing His Offspring to the Fair city of London,” Punch (3 July 1858). These cartoons are representative of a journalistic style widespread in the 19th century that wielded mass persuasion in its modern form. It relied on binary oppositions of dirty versus clean, poor versus wealthy, white versus black, and sick versus healthy, tactics still regularly employed. While disease metaphors peppered the pages of Punch in the Victorian period, by the 1890s the magazine routinely weighed in on the controversial subject of vaccination. During heated debates over evolution, race, and compulsory smallpox vaccination, Punch’s 1898 “Triumph of De-Jenner-Ation” scoffed at the 1898 Vaccination Act, which made smallpox vaccination compulsory, but included an exception clause for conscientious objectors, numbering a quarter-million in the first year alone (Figure 3). Figure 3: “Triumph of De-Jenner-Ation,” Punch (30 July 1898). 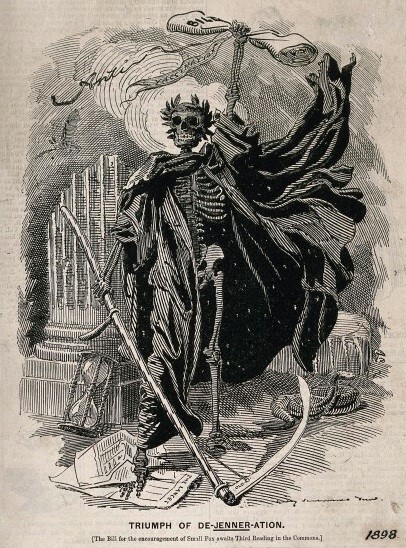 In the cartoon the Grim Reaper happily holds high the 1898 Act, while a serpent, on his left uncoils ready to strike in the implied near future. Here Punch lauded compulsory vaccination, but lamented the political shortcomings of the struggle between individual liberty and social good, thus setting the stage for an ongoing debate on vaccination that continued well after the Victorians. While there was no one agenda setting of political cartoons in the nineteenth century periodical press, it is clear that such mediated forms elicited social critique and formed the basis of discourses on health and disease familiar to us even today. Looking historically at political cartoons helps to demystify popular culture, and to remind that us that political cartoons are powerful technologies of cultural formation, not simple forms of entertainment. Dr. Jacob Steere-Williams is an Assistant Professor of History at the College of Charleston. His research explores themes surrounding the uneven development of modern public health, the centralization of state medicine, the production of scientific knowledge, and the notions of scientific expertise and technoscience.